Depends where Schmidt wants to play Addison. Most of those are outside bets. I read that the squad will be announced on Wed. The Irish Times also states that Will Addison is set to be included in the squad. Addison can cover wing, fullback, centre and out half so it isn't surprising that Schmidt wants to take a look at him with the RWC around the corner. I'd bet the house on Addison being a shoe-in. Joe has a stiffy for versatility and Addison is nothing if he isn't versatile. The guy is one classy player wherever he plays. I'd rather not lose him from the Ulster squad but Joe's the boss. On that note I'd rather not lose anyone from Ulster to the AIs, Cooney and Addison are just 2 of the players that greatly increase our chance of victory so you see where I'm coming from. I am never a big fan of these things for a couple of reason. Leinster could win the next 3 pro14s and the other 3 miss the playoffs every year. At least it's not like the Scotland one of win a world cup. Not sure if Schmidt can go away from a predominantly Leinster team for Ireland in the AI's. They are the best team in Europe and work extremely well as a unit. Sure there may be some better individual players from other provinces but the familiarity and understanding is what I feel wins big matches. Thought Sean Cronin played a blinder on Sunday, he could be in the reckoning as well for me. eirebilly wrote: Not sure if Schmidt can go away from a predominantly Leinster team for Ireland in the AI's. They are the best team in Europe and work extremely well as a unit. Sure there may be some better individual players from other provinces but the familiarity and understanding is what I feel wins big matches. Is there a balance to be struck though, between Leinster continuity and having a team that is visibly one step up in quality from Leinster - otherwise complacency might set in through over-familiarity with team-mates? Oh brilliant, I was wondering when this would come out. Do you have a link? Those are some big aims. Fair play. You may have a point here in that familiarity may cause over confidence leading to complacency but it is not something I have noticed in the Leinster team myself. No way I agree with number 2. Ireland were knocked out by Australia in 1991 and it gives me absolutely no comfort that they went on to win the tournament. The goal to make semis or beyond is the right goal IMO. You have to be ambitious. However, setting the goal is fine but ensuring that all the steps or goals along the way to get you there are in place is the real thing that they need to get right. Speaking about the plan, IRFU Chief Executive Philip Browne said: "The increased profile of rugby driven by on-field success has resulted in an increase in participation, especially through age-grade and the use of modified formats. "But of course we recognise the many challenges the game faces and we have sought to address these in this Strategic Plan as part of our effort to ensure the game, over the next five years and beyond, will be put on an even stronger footing for the generations to come. "The game continues to expand at every level and central to this expansion is funding. Currently, our professional teams, at national and provincial level, account for 93% of the game's revenues, of this some 80% is generated by the men's international team. "This stark statistic is reassuring and concerning in equal measure; the former as it recognises the phenomenal attraction of our senior international team to television rights holders, sponsors and supporters alike, while the latter highlights the extremely narrow base from which every other strand of the game must be funded." Commenting on the performance goals outlined in the plan, IRFU Performance Director David Nucifora said: "The focus will be to drive alignment across the game and ensure the talent pathways feed the high performance side of the game with a particular emphasis on Sevens and the interface between clubs and schools and the professional game. "Key areas of focus will be further advancement of the player management programme, coach education, talent development, investment in research and data analytics and the recruitment and retention of world-leading experts across the range of high performance disciplines. The delivery of a world class high performance centre will be a key element in driving the performance goals targeted over the next five years." Scott Walker, IRFU Rugby Development Director, spoke about the growth goals in the plan, saying: "We recognise that one of rugby's principal challenges is to retain age-grade players, and if such retention can be maximised, the game will grow. Players of all ages have a clear choice as to whether to participate in rugby or not. "The strongest influence on the choice they make will be the quality of the experience which they have within the game during their formative years. If the experience is positive, then they are likely to remain within the game. If negative, they will be lost from it. "Therefore, our priorities should be to build a system which provides the best sporting experience for young people in Ireland, and which gives them good reason to continue in rugby. In parallel, the IRFU will work to establish competition formats across 15s and Sevens which allow more players to transition to adult rugby and beyond. "At the same time the IRFU will embark on a programme of facilities modernisation and development of a network of artificial pitches." The point behind that is the possible thinking that playing for Leinster vs say Munster has similarities or expectations in some areas between a similarly based Irish side versus say South Africa. If a test side is over represented by one club side it is how they blend in the non players that can make the difference. A Leinster plus thinking can have its drawbacks. In NZ the Crusaders have been far more dominant than any other side in twenty years but we a very careful the ABs are never thought of as Crusaders plus. In Oz the thinking is Cheika places too much focus on playing Warraths players ahead of others, even when they continue poor form...Foley, Hanigan, Mumm, Phipps etc. That sort of selectingcan creep in. Thinking that a Leinster based player will recapture his Leinster form while playing test matches can be dangerous. Spot on T-man. Exactly my thinking - better expressed. It’s not like when Ireland were Munster + BOD and Tommy. Not a lot in it. The other 3 provinces would have an advantage in the backs. I didn't even include Cooney, McCluskey, Tom Farrell etc. When is the squad announced? I don't see anything on IRFU.ie. I assume its around lunch time today? Collapse2005 wrote: When is the squad announced? I don't see anything on IRFU.ie. I assume its around lunch time today? Apparently at around 3 today. Well there's the proof for Ebop. Gun is schizophrenic. It's a common misconception but schizophrenia isn't the same thing as having multiple or split personalities. Yeah, but in a joke it's much more satisfyingly punchy than "Guns has Dissociative Identity Disorder"
SecretFly wrote: Yeah, but in a joke it's much more satisfyingly punchy than "Guns has Dissociative Identity Disorder"
Is secretfly your real name or do you have another identity? No schizophrenics aren't generally associated with thinking they are someone else, that's the stuff of Hollywood movies. I expected the squad announcement to land by now. "Some people think schizophrenia causes a "split personality" or violent behaviour. This is not true. Its a fantasy dreamt up by Hollywood. Hollywood is full of stuff like that, like how in thriller cop movies they always try to keep the serial killer on the line so they can triangulate their position. The reality is they can determine the position of a caller instantly, you don't need to keep anyone on the phone. Are all Schizophrenics violent? No - but the condition can lead to aggression and therefore violence. Do all Schizophrenics think they are Donald Trump? No - but the symptom can be present as a distinct variant of the grandiose delusion such people can experience. I thought we were talking about split personality not violence. The links you have provided all say its not related to split personality disorder. You are talking shoite as usual. In other news Murray back soon. Yes, out for the ABs match for sure. Drawback for their kicking game. Looks a good squad but I suppose the lack of discussion is it is similar to what was expected. Good to see players who have shown some form getting a shot. Taylorman wrote: Yes, out for the ABs match for sure. Drawback for their kicking game. I added player ages too. I think it'll be a combination of second team and getting first teamer up to speed. The Italian side has already been named, bizarrely enough. He also averages almost a try per game against the ABs. Or do we now include 'selective' exclusions to bring the average up? Chicago perhaps? That untested side needs a captain, prof. I know it could be Ruddock but I wouldn’t underestimate the Italians that much. O’Shea would relish such an opportunity. Campagnaro and Morisi are no slouches, and Canna is the best at getting the most from his backline. I think it has to have either Best or Sexton or possibly POM as one of the ‘Co-captains’. And an experienced head in the back three with either Earls or Kearney. There’s certainly an argument for the Ulster midfield pairing but I’m not sure if it would be a better trial in the USA match. I might make it a Leinster front row to start of McGrath, Cronin, Porter and a Munster front row to finish with Kilcoyne, Scannell and Ryan. It would be a good fiery bench to unleash though - like the selection. Yeah one per game is a stretch alright however, most of the tries (5 I think) have come in his more recent games when he was more established. He has certainly scored more v NZ than Smith has v Ireland and probably more than any player v NZ at the moment. Lol I know you are desperate to discount Chicago and you have lots of ready made excuses. I think the Italy game is good for Carbey and Cooney to show they can boss an international game. Brendan wrote: Looks a good squad but I suppose the lack of discussion is it is similar to what was expected. Good to see players who have shown some form getting a shot. Extremely strong squad, in fact the best I can remember. No issues with the squad but unlucky to miss out are Tom Farrell and Ultan Dillan. Schmidt seems to like Arnold so that has cost Farrell but in Dillan's case it is just the quality of the second row options. In fact I think Henderson or more likely Toner may slip out of the 23 if Beirne continues his current form. In the back row it looks like O'Mahoney and Stander plus A.N. other, with O'Brien as the likely bench option. Schmidt is a big fan of VDF , it is very close between him and Leavy as first choice 7, with the loser probably missing out on the RWC squad in favour of a more versatile back rower. It's great to see some real depth in the centre, again I would assume Henshaw and Ringrose are fairly nailed on with Aki on the bench but I think Addison is a real dark horse and could be very close to the first choice 23 after the series. Good to see McCloskey get a call up but suspect he and Arnold are needing a few injuries to be close to challenging the big 3. Half back looks good even without Murray. I'm expecting Marmion to start with McGrath on the bench and Cooney to get a start against the USA or Italy. 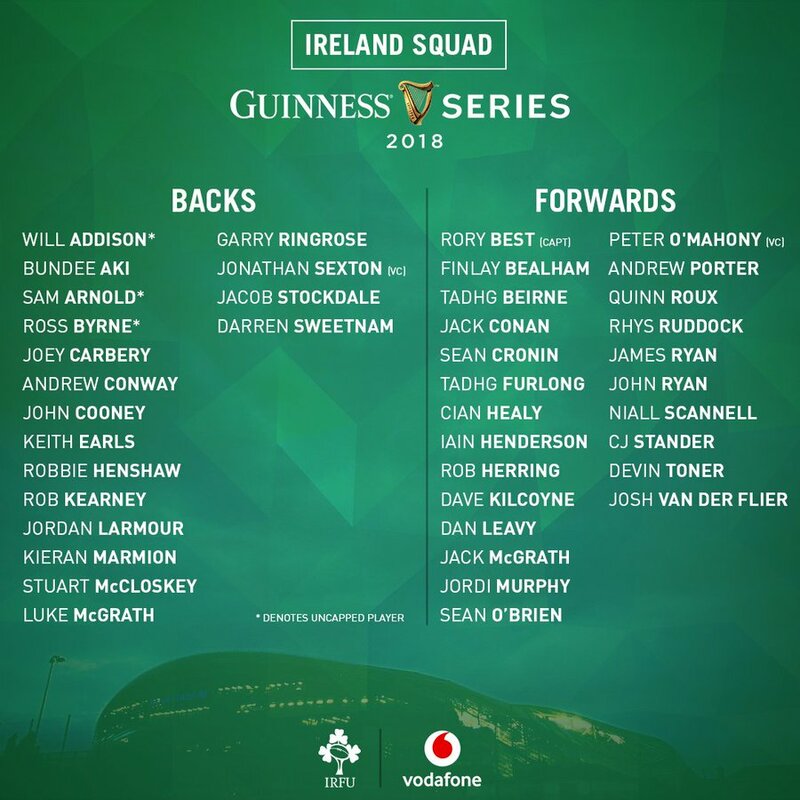 I thought Schmidt might take the opportunity to cap Burns to tie him to Ireland so his non-selection suggests he is a long way down the pecking order. The back 3 still looks like the weakest area. Addison can cover 15 but I think we are very reliant on Earls and Stockdale to be firing on all cylinders to give us any threat out wide. The sooner James Lowe qualifies the better. Overall expecting 4 convincing wins. I agree. Imagine leaving one of VdF or Leavy out of a RWC squad. Mad. The mood for me is caution.... didn't really have that for the last 6N when I was my most confident ever. I think we might be hit somewhere. The obvious hit looks like ABs. And to be honest, as most might expect it there, it wouldn't be such a shock. But it'll be embarrassing if we're hit somewhere else instead. I just feel there is a lot of new tension added to the mix now with players starting out on the beginning of yet another assault on WC placements. The heads will be all over the place - anticipation of being part of the adventure, injury concerns, saving juice etc etc. Any loss of focus on process and we're sunk. Not feeling overly confident. I think our hard preps as a team will be delayed a while longer given how long and important 2019 will be. ....The back 3 still looks like the weakest area. Addison can cover 15 but I think we are very reliant on Earls and Stockdale to be firing on all cylinders to give us any threat out wide. The sooner James Lowe qualifies the better. James Lowe is NZ and England qualified through his father. His contract runs until June 2020. He would be three years resident in mid-Nov 2020 so if contract renewed, the earliest he would be available for Ireland selection would be Six Nations 2021 - over 2 years away. Notwithstanding that, the guy suffers from rheumatoid arthritis, and he'll be 31 by the time of RWC 2023. I wouldn't bet the house on him. Problem is, even with arthritis, he's still speedier, more elusive and dangerous than just about anything else operating in Ireland right now. Two more years of toil on the bones and joints and he should just be arriving at a level of equality with those other guys. So still good enough to select if still playing and still here. Hmmm, I wonder is Lancaster whispering sweet stuff in his ears about his English qualifications. Might be a nice meeting point for Lancaster and him a few years down the line in England gear. Such intrigue!!! Jesus does he, that's horrific. Not withstanding that my guess is he will never play for Ireland. Remember Te'o at Leinster? He had a contract that would make him residency-qualified. And then big-name Worcester came a-whisperin' 'n' a-callin'. Eddie J sang his his sweet tunes and it was bye-bye Te'o, bye bye.